Yesterday we considered darkness’ age-old foe, light, but today we will look more closely at darkness. As mentioned yesterday, anyone can easily see that light is desirous over darkness. Scripture affirms that light is good and darkness is bad, so it is only fitting for a director like Guillermo del Toro to exploit darkness. If the point of a horror film is to scare its viewers, than any wise director would employ the use of darkness. By the way, think of how dark most Hollywood horror films are….not a coincidence. Numerous times in Scripture we are told to fear God. We are also told that the fear of the Lord is the beginning of wisdom, but what does the Bible say about being afraid of the dark? We established yesterday that darkness is a fearful thing. The Psalmist even tells us that the Lord will protect us so we won’t “fear the terror of the night.” (91:5) So there is specific mention of the night/darkness as terrifying, but God is greater than that fear. So the question before us is this, is there ever reason to be afraid of the dark? I think the Bible answers in the affirmative. Even though there aren’t many Scriptures speaking specifically to the fear of darkness, there are several verses that reference darkness with the implications of being fearful. There are about 200 verses that include the word ‘dark’ or ‘darkness’ in Scripture. Therefore, the Bible is not silent on this. Darkness in Scripture is seen as something incomplete when we think back to creation (Gen. 1:2). Darkness is seen as contrasting to good (Isaiah 5:20), as judgment (Amos 5:20), in reference to hell (Matthew 22:13), and what we were apart from Christ (1 Peter 2:9). Therefore, one must not be a rocket scientist to see that darkness is bad and light is good. So should anyone be afraid of the dark? While everyone should fear God and him alone, I think Scripture is clear that we CAN be afraid of the dark. If we see the dark as God’s wrath and judgment, it is a frightful thing. However, if you are a believer in Jesus Christ, you have been brought from darkness to light [Eph. 5:8], that is, from death to life. Therefore, Christians can stand firm and feel safe in the midst of darkness, knowing we will enter the Father’s marvelous light. On the contrary, if you are one that has not bowed the knee to Jesus Christ and has not been brought into his light, you should be very afraid of the dark. Don’t Be Afraid of the Dark – Why not? That’s right…another horror film. Since we’ve started this blog, there has been a horror film released every weekend. There have also been, at least, three remakes of films at the local box office. This may tell us two things. First, there may not be much creativity left in Hollywood and second, that horror movies tend to do pretty well at the silver screen. I’m not sure if I agree with the former, but the latter is definitely true. Horror films seem to do quite well, monetarily speaking. Even if the plot is weak and the acting is bad, people still turn out for a good scare. However, with Guillermo del Toro at the wheel of this horror film, I think we can expect a little more from this than our typical horror diet we feed on at the box office. Especially after what I read about the opening scene to this rendition. It sounds pretty creepy. Del Toro’s previous work shows us that this won’t be your run-of-the-mill horror film. While I’m not a huge fan of his work, he is a thoughtful filmmaker. 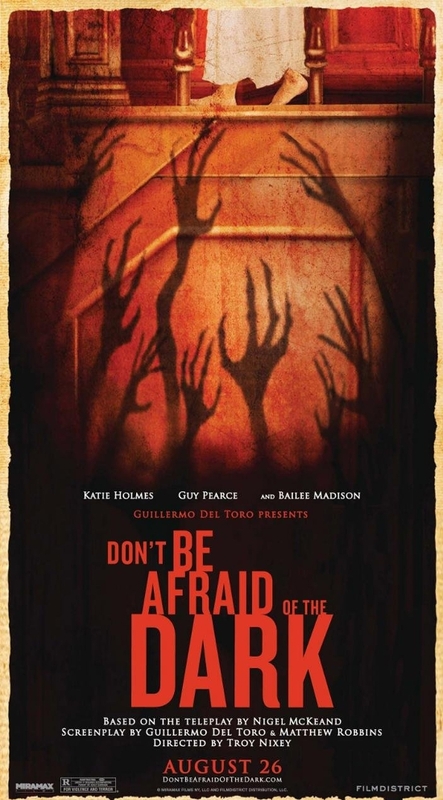 And his remake of this ’73 cult classic Don’t Be Afraid of the Dark, draws from a classic fear in us all…the dark. I know there was a time my life when I was very afraid of the dark. Truth be told, in certain contexts, the dark is still quite frightening. I know I can’t be the only one who is somewhat afraid of the dark, or has at one point, been afraid of the dark. For starters, someone made a movie out of this fear and then re-made that movie, so more people than we might realize are frightened by the absence of light. Why is that? Before we analyze darkness, let’s consider it alongside it’s foe – light. These two can never perfectly dwell together. Where there is light, there is no darkness, and where there is darkness there is no light. Light reveals all things and gives us feelings of warmth and security. Darkness, however, conceals and cannot be trusted. It can deceive and harm us. I can remember working at Alpine Camp for Boys and finding myself in a frightening position. I was walking back to my cabin, which was at the back of camp, but the other guys I was walking with went to their cabins, which were located before mine. I realized I would be walking the road alone, close to midnight. I was walking along the gravel road in utter darkness. No street lights, no light from the moon, in complete absence from light. The only way I knew I was still walking on the road was the sound of gravel. It was a terrifying walk and I slowly picked up the pace as I approached my cabin (it was a manly pace). The darkness was deceiving me, making me feel that something was with me. I paused thinking I heard other footsteps a few times. In short, the darkness could not be trusted. Light is a good thing…a great thing! Being in utter darkness only helps you appreciate the gift of light. This gives new meaning to the words Christ spoke when he said, “I am the light of the world. Whoever follows me will not walk in darkness, but will have the light of life.” [John 8:12] Scripture affirms again and again that light is good and Jesus is the light of the world. In him there is complete warmth, love, trust, and security. If this is true of light, by contrast, darkness should be terrifying. We will take a closer look at this terror in tomorrow’s post, so be sure and check back.